Every year I look forward to E3, the annual Electronic Entertainment Expo. It’s a ton of fun watching the pre-show press conferences to see what cool video games are coming out; seeing interviews with developers and designers is inspiring, and then actually getting my hands on those games at the Expo in LA is immensely satisfying. Beyond the games, this year also showed a lot of new movement and changes happening in the game development industry. Here are the highlights from E3 2017. One of the most exciting developments to come from E3 2017 is a new push to get communities involved in creating content for games, and—even more significant—getting paid for it. Seeing Mojang (the creators of Minecraft) and Bethesda offering this option is encouraging as well. Minecraft featured their new Community Marketplace where approved community creators make content like skins and resource packs and then sell it to other users. Bethesda announced a similar concept with their Creation Club. There, invited creators will craft mods, quests, weapons and other items to sell for Skyrim and Fallout 4. Bethesda is taking it a step further however, and will require creators to pitch their product, which then gets a full development cycle by Bethesda developers and QA specialists. How Does This Benefit Your Student? The biggest piece of advice I would give students at the end of a camp session is to keep practicing. Keep working on your skills and making things! Getting into the game industry is difficult, especially as a designer. Enrolling in a camp like iD Tech helps students learn those skills and get started on their pathway, but it’s that outside practice that’s going to hone students’ skills, making them more efficient and professional. I love when companies provide avenues to help with that practice. These content creation communities will help people develop shippable projects and, for a few, help support themselves monetarily at the same time. It’s also a huge boost for a college application or a resumé, plus putting that income towards a college fund is an added bonus! Virtual reality (VR) has been one of the biggest developments in gaming technology in the last few years. VR uses screens right in front of your eyes and detailed motion controllers, so you feel like you’re literally inside the game. Last year, we finally saw the big VR headsets come to consumers with products like the Vive, Oculus Rift, and PlayStation VR. Now that these systems are becoming established, we’re starting to see a big push to develop VR content. Lots of VR games were announced at E3, including the platformer Moss, a fishing game based on Final Fantasy 15. We’re also seeing horror games start to move heavily towards virtual reality. The Inpatient thrusts the player into the role of a patient in a mental health facility and forces the player to question what’s real and what’s not. Transference plays with the idea of a “recorded consciousness” and what comes with experiencing someone else’s life. VR is a natural fit for horror. Normally, in horror films and previous video games, you have some space between you and the screen. If something spooks you, you can hide under a pillow or peek at it through your fingers. With VR, you don’t have that escape. You’re in the middle of what’s happening. That really helps ramp up the fun scariness factor. The thing I find fascinating about VR right now is that the rules aren’t established. Game design is iterative—your designs become influenced by the games you play. However with VR, the gaming community is still figuring out what you can and can’t do. How can you make your player feel like part of a story without taking control away from them? How does personally inhabiting a game world influence your moral compass? What emotions can you generate in a player who is closer to their game than ever before? The experimental nature of VR means the world of game creation is completely wide open for your student; if they want to push the boundaries, now’s the time. Of course, talking about E3 wouldn’t be complete without one thing… the games! Lots of cool new games were on display at E3. The Nintendo Switch is quickly becoming well established, with new Mario, Splatoon and (finally) Metroid coming. Microsoft is pushing 4K with their new Xbox One X and games like Forza Motorsport 7 to show it off. Sony is leading the charge on VR with a huge list of PlayStation VR games coming. Here are the details on some of the highlights. Mario games have always been some of the most influential and popular in gaming, and Super Mario Odyssey looks like it’ll have me transfixed just like I was as a kid (though hopefully with less sitting cross-legged on the floor). Those inventive levels and environments are the other big hook for Odyssey; this game has a ton of personality. There’s a new open-world city, New Donk City, with brilliant references to other Nintendo games (you can run into Mayor Pauline on Cranky Street then go and find Captain Toad for new adventures!) You can see this personality just oozing through every crack of this game, even down to how cool the booth was. Monster Hunter is one of the most popular franchises in Japan. I’ve tried to play it before, but it’s been primarily a handheld game with very demanding controls, leading my meaty paws to cramp up and hurt after just a few missions. With Monster Hunter World, audiences are finally getting a version on the main consoles and PC, so now I’ll be able to indulge in all the giant monster stalking and slaying that my gaming heart desires. In Monster Hunter World, you sneak through jungles tracking giant lizards, dragons, and other various monsters before you attack (with up to 3 other players!). The game features drop-in/drop-out multiplayer, so it’s easy to link up with your friends. This entry into the franchise is pushing a living environment. Monsters have their own hierarchy, so some of them will attack each other or try to eat another. There’s also realistic environmental destruction; the demo I saw had the monster bodyslam into trees to then throw them at players. It’s exciting and unpredictable. They’re also making changes to the game to welcome more newcomers, simplifying tracking monsters and removing load screens, so now when you run from the giant lizard T-rex thing, you don’t have a moment to breathe. Monster Hunter World will be out on PC/PS4/Xbox One early 2018. It’s very rare to see companies let other companies use their intellectual property, so when I saw that Nintendo and Ubisoft teamed up to combine the Mario property and Rayman Raving Rabbids, I was curious. They’re both platformer games, so, yeah I could see that making sense. Then Mario did something out of character—he grabbed a laser cannon, ran into cover, and I lost my mind with excitement. Mario + Rabbids: Kingdom Battle is a turn-based squad tactics game. You move Mario and friends around a battlefield, dodging into cover and flanking your enemies. There’s some really cool abilities, like being able to spring off your friends to get deep into enemy territory. The game has a ton of personality too, like how Rabbid Peach is obsessed with selfies and Luigi is still carrying around his trusty ghost-busting vacuum. I never expected to see another Mario game developed outside of Nintendo, let alone a tactics game. Combine that with the personality on display and this was easily one of my biggest surprises of E3. It’ll be out in August, on the Switch. 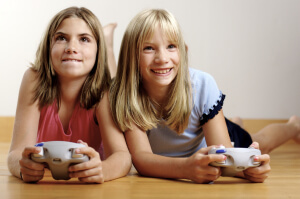 Staying on top of video game developments is essential if your child wants to pursue a career in the game industry. Do your research (paying special attention to the rating systems for age-appropriateness) and then buy your student some games! Encourage them to not only play but to think critically about the games they’re using and the experience they’re having while they play. Not sure how to do that? Don’t worry, we’ve got your back. Sign your aspiring game developer up for any of our cutting edge video game design courses and they’ll learn more in a week (or two, if you’re thinking iD Game Design & Development Academy for your teen!) than you ever thought possible. Check them out here or find a location near you to register today! But hurry—courses are sold out all over the nation.